Enchondromas are thought to be growth plate remnants that are not resorbed and either persist or begin to grow in the medullary canal on the metaphyseal side of the growth plate. Depending on the position of the original piece of the growth plate, cartilage remnants may be remodeled into the cortical bone, resulting in cortical and juxtacortical chondromas. These isolated fragments of cartilage grow very slowly in a lobular configuration and demonstrate ossification at their periphery. Enchondromas occur almost exclusively in the appendicular skeleton, and about half involve the hands and feet. The proximal humerus and the proximal or distal femur are other affected sites. Enchondromas of the pelvis, vertebrae, or ribs are uncommon. Patients range from age 5 to 79 years, with most patients in their 20s to 40s, [2, 4] and lesions are equally distributed between males and females. Enchondromas are often discovered incidentally and are not usually painful. Pain as the presenting symptom for a cartilage lesion arouses the suspicion of chondrosarcoma,  except when the pain is due to an associated fracture, especially in the hands and feet. On plain films, enchondromas are predominantly lucent with internal mineralization (see the following image). [2, 6] The calcified foci vary from powderlike to dense aggregates. This mineralization is a result of the endochondral ossification that accompanies these tumors. Computed tomography (CT) scans reveal the internal matrix production. Examination with magnetic resonance imaging (MRI) sequences show a high water content on T2-weighted sequences and reveal a lobular organization. Plain films will reveal lytic lesions with scalloped borders. When internal matrix is present, it is arranged in arc and ring or stippled patterns. 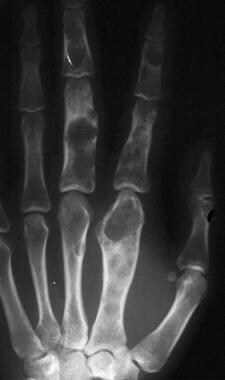 A fracture can be associated with the lesion, especially in the small bones of the hands and feet. Most enchondromas are treated by curettage, and resected specimens are rare. The curetted material is hyaline cartilage and thus is grayish-blue and glistening, sometimes mixed with yellow, calcified foci. 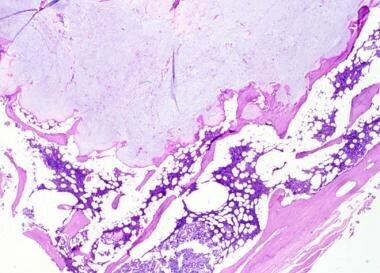 Microscopically, enchondromas demonstrate a lobular arrangement of the neoplastic cartilage. The lobules are frequently rimmed by a narrow band of reactive bone as a result of endochondral ossification. The key feature is that the cartilage lobules are surrounded by bone and do not show an infiltrative pattern. The lobules can be hypercellular, especially lesions in the hands and feet, as a result of trauma. Mitotic figures are usually not noted in enchondromas unless a fracture is associated. Atypical mitotic figures are never noted. 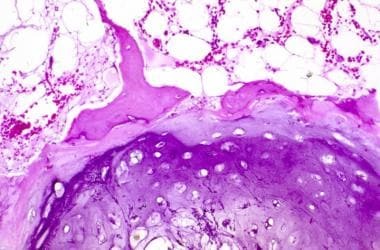 When these lesions are sampled with fine-needle aspiration (FNA) or other cytologic preparations, the material consists of thick, metachromatic cartilaginous tissue with small, uniform cells. These features should always be correlated with the pertinent radiologic studies. The following images depict histologic characteristics of enchondromas. A focal increase in the cellularity of enchondromas can occur when they are traumatized or when an associated fracture is present. This is especially true of lesions in the hands and feet. Care should be taken not to diagnose these lesions as malignant based solely upon their cytology. Enchondromas are generally well demarcated from the surrounding marrow and trabecular bone. Myxoid degeneration can be noted in enchondromas. However, the surrounding maturation to bone is characteristic of a benign process. At higher magnification, the bone formation at the periphery is readily identifiable. The bone formation is a result of endochondral ossification. 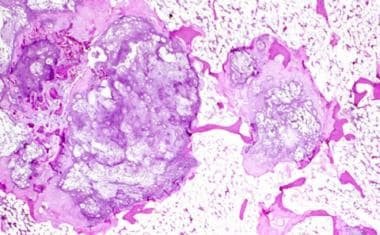 Immunohistochemistry is not routinely used in enchondromas, but chondrocytes are S100 positive if a question exists as to whether a tumor represents a cartilaginous tumor in a limited sample. Cabay RJ, Reddy V, David O, et al. 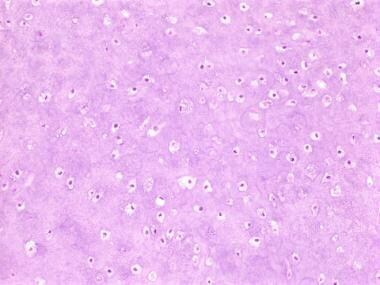 Cytologic features of primary chondroid tumors of bone in crush preparations. Diagn Cytopathol. 2008 Oct. 36(10):758-61. [Medline]. Walden MJ, Murphey MD, Vidal JA. Incidental enchondromas of the knee. AJR Am J Roentgenol. 2008 Jun. 190(6):1611-5. [Medline]. van der Geest IC, de Valk MH, de Rooy JW, Pruszczynski M, Veth RP, Schreuder HW. Oncological and functional results of cryosurgical therapy of enchondromas and chondrosarcomas grade 1. J Surg Oncol. 2008 Nov 1. 98(6):421-6. [Medline]. Ojeda-Thies C, Bonsfills N, Albinana J. Solitary epiphyseal enchondroma of the proximal femur in a 23-month-old girl. J Pediatr Orthop. 2008 Jul-Aug. 28(5):565-8. [Medline]. Akiyama T, Yamamoto A, Kashima T, et al. Juxtacortical chondroma of the sacrum. J Orthop Sci. 2008 Sep. 13(5):476-80. [Medline]. An YY, Kim JY, Ahn MI, Kang YK, Choi HJ. Enchondroma protuberans of the hand. AJR Am J Roentgenol. 2008 Jan. 190(1):40-4. [Medline]. Scivetti M, Maiorano E, Pilolli GP, et al. Chondroma of the tongue. Clin Exp Dermatol. 2008 Jul. 33(4):460-2. [Medline]. Choi BB, Jee WH, Sunwoo HJ, Cho JH, Kim JY, Chun KA, et al. MR differentiation of low-grade chondrosarcoma from enchondroma. Clin Imaging. 2013 May-Jun. 37(3):542-7. [Medline]. De Coninck T, Jans L, Sys G, Huysse W, Verstraeten T, Forsyth R, et al. Dynamic contrast-enhanced MR imaging for differentiation between enchondroma and chondrosarcoma. Eur Radiol. 2013 Nov. 23(11):3140-52. [Medline]. Kransdorf MJ, Peterson JJ, Bancroft LW. MR imaging of the knee: incidental osseous lesions. Radiol Clin North Am. 2007 Nov. 45(6):943-54, v. [Medline]. Kulshrestha P, Das B, Iyer KS, Sampath KA, Sharma ML, Rao IM, et al. Cardiac injuries--a clinical and autopsy profile. J Trauma. 1990 Feb. 30(2):203-7. [Medline]. Singh AP, Singh AP, Mahajan S. Periosteal chondroma of the sacrum. Can J Surg. 2008 Oct. 51(5):E105-6. [Medline]. [Full Text]. Tallini G, Dorfman H, Brys P, et al. Correlation between clinicopathological features and karyotype in 100 cartilaginous and chordoid tumours. A report from the Chromosomes and Morphology (CHAMP) Collaborative Study Group. J Pathol. 2002 Feb. 196(2):194-203. [Medline]. Chondromas display large areas of basophilic extracellular cartilage matrix with broadly scattered bland chondrocytes.